Edit : I cannot have the images any bigger, so you will have to zoom if you can. The quality when zooming is good. I will try to explain as much as I can meanwhile. 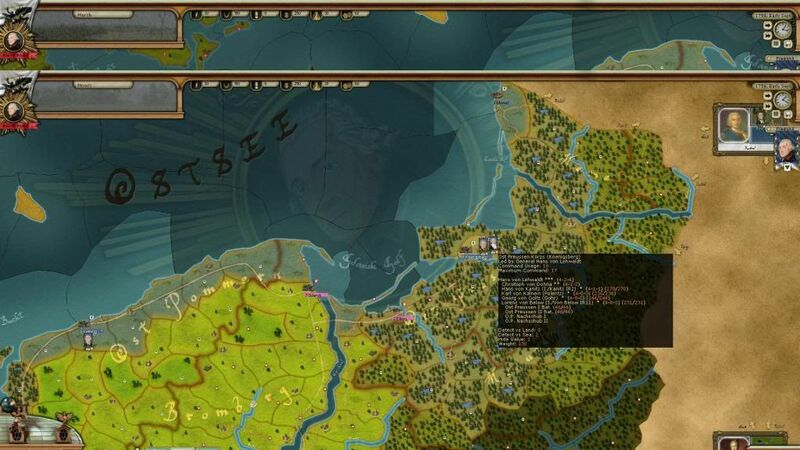 So I decided to make a Let's Play / After Action Report about Rise of Prussia, a game that should cater to most of the traditionnal Paradox crowd : it is not full of flashy animations (it doesn’t have any actually), but it is a complex game where patience and planning is necessary. No instant gratification, just bad news stacking on more bad news. 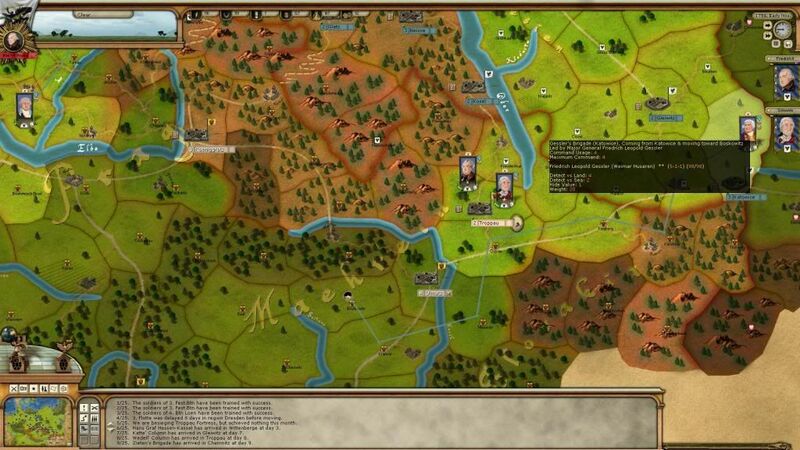 It is unfortunately fairly unknown – even though it is relatively accessible for a wargame. The AI of the game is outstanding, but I am going to do a PBEM [Play-by-email]. The other player may not post here, but rest assured he will play as meanly as he can. 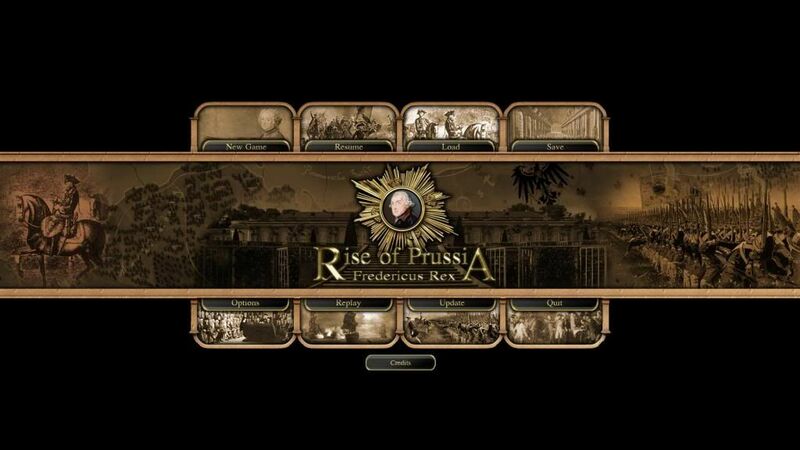 Rise of Prussia is a Simultaneous Turn Based game. I play my turn, my opponent plays his - and then both actions are resolved at the same time. A "turn" lasts 15 days. This AAR is intended for beginners, so I will explain game concepts from time to time, as the need arises. 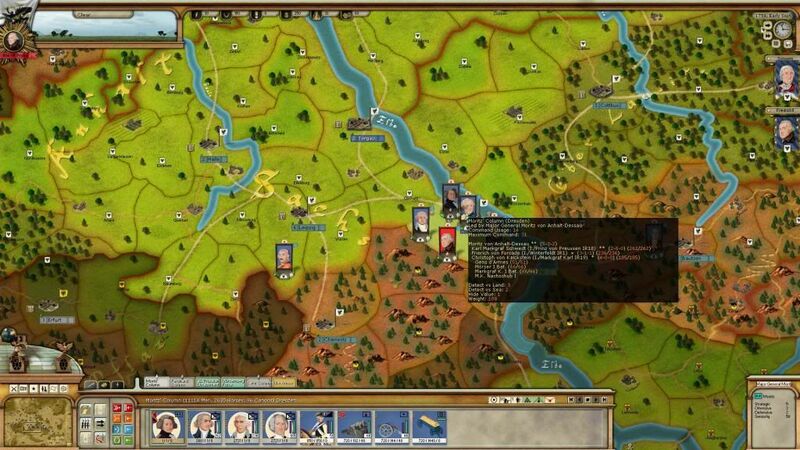 I will play the 1757 Grand Campaign (longest game possible), with Historical Attrition, Historical Stats for Leaders, No redeployment, Normal Activation Rules, Long Delayed Commitment in Battle, so in one word, as realistic as possible. 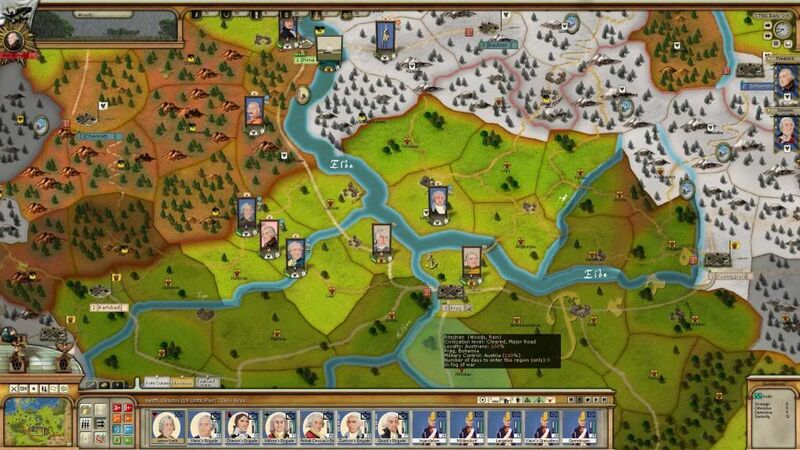 I will take Prussia and its coalition, my opponent will take Austria and its coalition (there are only 2 players : each player is playing all the countries involved in each coalition – which does not mean that “nationalities” of units have no impact – far from it). It is quite fitting, because having played 3 games against that opponent (2 at Birth of America, 1 at Revolution Under Siege), I know he is a master of defense, but too careful and slow in attack - which is pretty historical for the Austrians. I believe I am a more balanced player, even though not quite as aggressive as the real Frederick was. Anyway, what is the situation in 1757 ? Well, see by yourself here (explanations to follow). Long story short : during the First Silesian War (1740-1742), Frederick used the fact that Austria had its hands full in the War of Austrian Succession to quickly seize Silesia, uniting the two parts of his Kingdom, then peaced out of the war – the War of Austrian Succession would last until 1748. This angered both its enemy (Austria) and its allies (France and Russia). 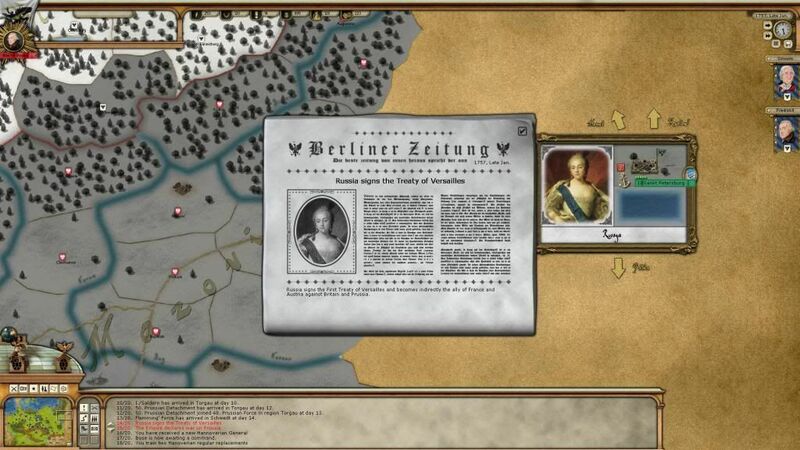 In 1757, Austria is building an alliance to take Silesia back from Prussia. Prussia has not a chance against a Austria-Saxony-Russian-French-Swedish coalition. 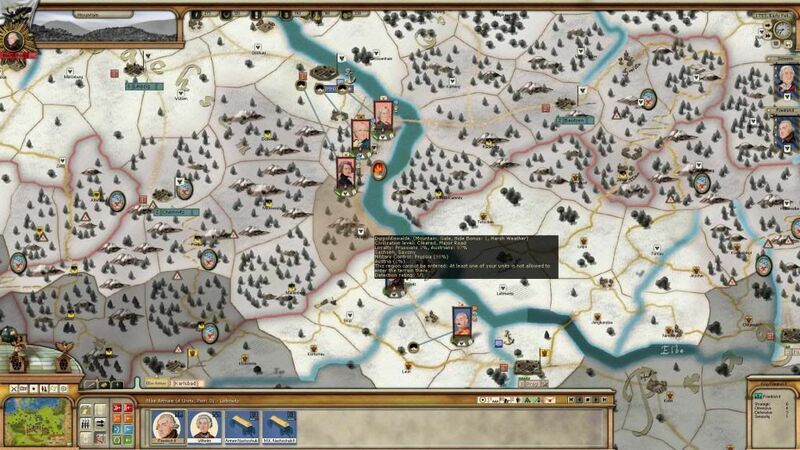 But Frederick has a plan : if he strikes fast and hard, he can kick Saxony and even Austria out of the war. Without Austria, France and Russia would have no reason to carry on fighting, and Sweden is not strong enough on its own. 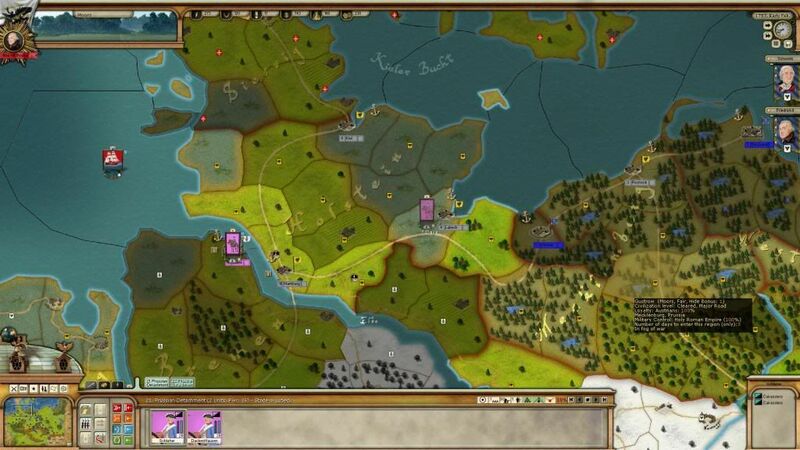 Thus started the 7 years war, with a massive offensive on Saxony, to destroy it before it mobilizes. 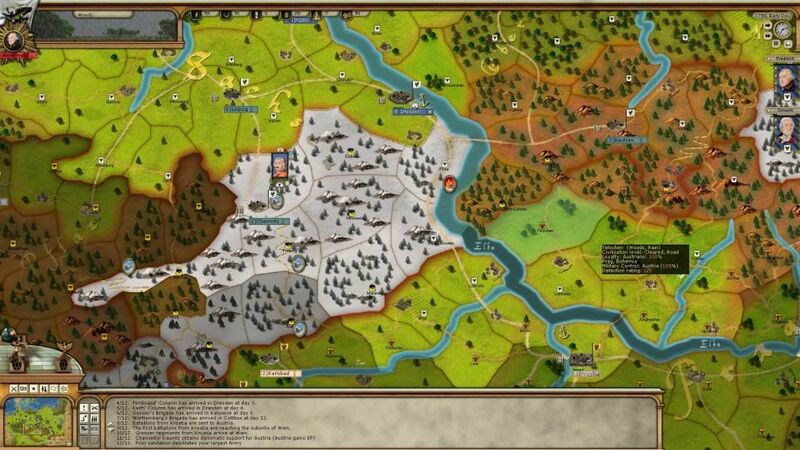 Saxony is annihilated, its cities seized, and the moderately big army it could assemble is sieged at the Pirna Camp. Which is exactly when the campaign starts. What are my objectives for this campaign ? Objectives are on the left page, while cities on the right page are just nice to have (and bring points if you cannot get a decisive victory). Yes, you saw well ! Only a few days of walking between my objectives. Why is the map so large, then, and why does it includes all of Germany and Poland ? 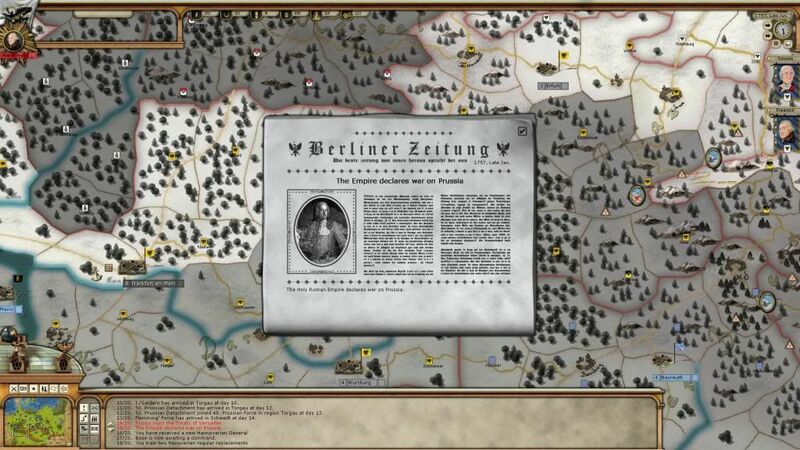 No, new objectives won’t appear, but new fronts will – except if I crush Austria quickly enough. You will see that going from Pirna to Vienna will be a daunting task. Yes – Sweden had territories in Northern Germany back then. Remains of the famed Gustavian “Swedish Empire”. Hannover is a greyed out objective because it is neutral for now – quickly enough it will become my strongest ally. Poland is neutral, and everyone can walk through it. The Poles know why, but they don’t like to talk about it. 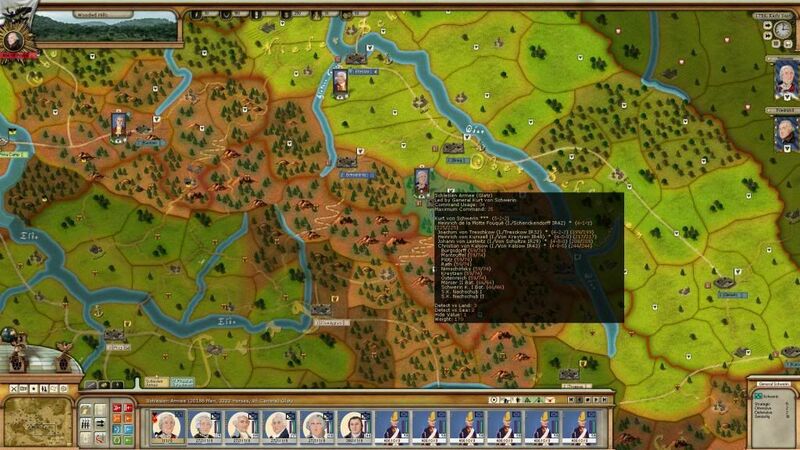 GAME : In the last pic, a Prussian King is hiding. Can you find him ? At the beginning of the campaign, there is only one front : the Austrian-Prussian Front. The Prussians have some great generals, one of them being the badass Frederick the Great himself, who led his troops in battle himself. 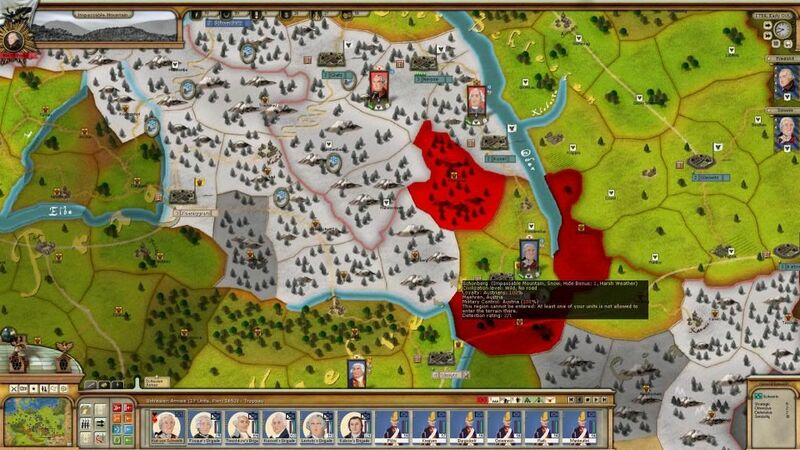 He is not my absolutely best general, but he is close enough, which means I don’t want to pay the political cost to replace him as the Commander-in-Chief of my armies – because there is such a cost. Prussian soldiers are elite. Many of them are Grenadiers, which is basically the “elite” force of the game, but even the regulars are good enough. I have a significant cavalry, but not a huge one. On the other side, Austrians have horrible “leading” generals, with the exception of General Daun, the master of Defense ; I am probably going to talk a lot about him (basically – I probably won’t attack wherever Daun, except if I am massively superior). Their troops are only average. So how can Austria hope to win ? Well, it cannot hope to win at the beginning. But time plays for them : as more battles occur, their poor generals are going to be demoted and once they have hacked through the dead wood, they have good generals. As more battle occurs, my Grenadiers will die and I will have to recruit troops who are no better than them. But more than everything else, time plays for them because they are in defense... They will quickly have an army twice or three times my size, and their allies will come help them, increasing this ratio even more (we are speaking of Russia and France, there). So if Austria can defend one or two years, it will be able to take initiative again. Here is a quick review of my main column (I have already modified a bit compared to the beginning of the game, in order not to have to say the same thing twice. I’d like to get over with the presentation ASAP to jump into action. 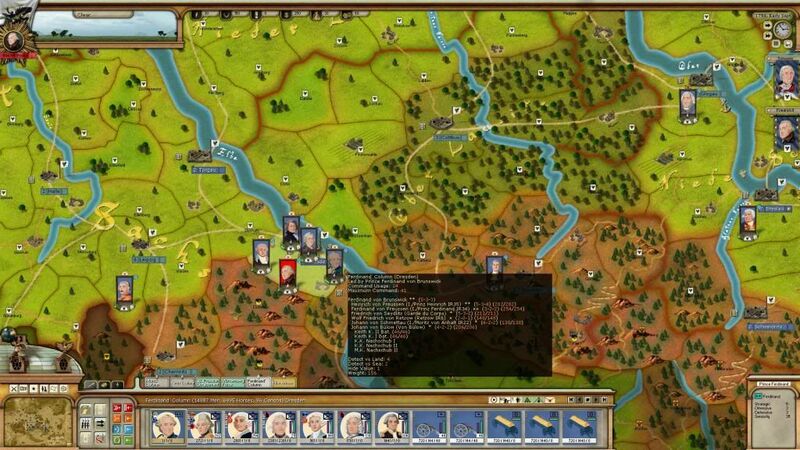 At the beginning of the game, Wilhem was in command of a column, but he is by far my poorest grand general, and since he has a lot of seniority (he is supposed to command the force he is in), I put him with Frederik, who obviously still outranks him. In red, you can see the columns commanded by Frederik as a Commander-in-Chief (not directly). As long as those columns are not too far from Frederik, he gives them various bonus I might get into later. Keith Column with 25 000 men, 13 000 horses and 144 canons, is led by Keith (duh! ), by far my best general – so I have him lead my most powerful column (I can change the composition of columns in a couple clicks). Ferdinand (von Brunswick) column, with 15 000 men, 7 000 horses and 96 canons, is my second largest army. 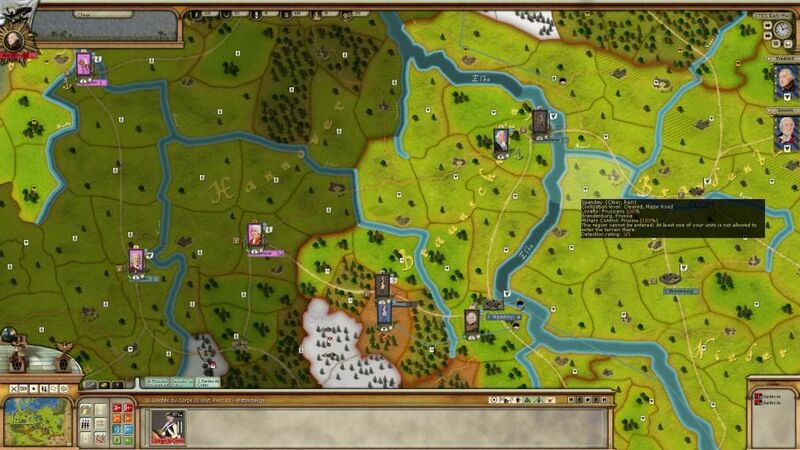 Ferdinand is a great general, and is especially good in leading extremely large armies thanks to his special capacity. With only 11 000 men, 2 600 horses and 96 canons, Moritz's (von Anhalt-Dessau) column is the smallest one. Moritz himself is ok as a general, but has the special malus “reckless”, so I ll keep him in reserve more often than not. 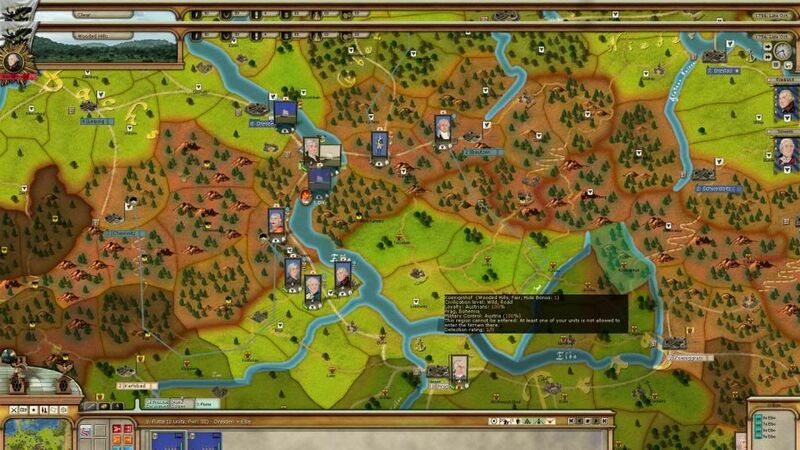 Having fresh troops ready can save your armies in this game. Johann von Wedell's column is on the east, with a little more troops than Moritz’s. Von Wedell is not really a good general, and I am planning to replace him as commander of his column as soon as possible. Finally, von Schwerin has an army on his own (=it is not part of Frederic’s columns), and a large one (20 000 men, 3 000 horses, 96 canons). 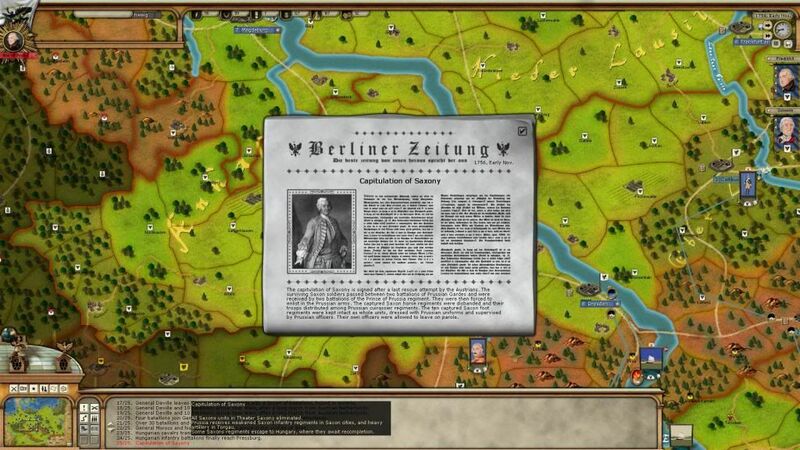 Schwerin has somewhat poor stats (still better than what the Austrians have) but two great special capacities : Brave (Keith has that as well), which means his troops are more cohesive – more resilient in battle - and Admired Commander – which means his troops recover their already increased cohesion faster. This makes him a good general. Not outstanding, though. I won’t show all the other units I have : most of them on this front are cavalry units (Zieten’s in Leipzig, Württenberg’s in Dresden with Frederic and co, Gessler’s in Breslau). They are independent forces. How do you know who is a good general, and who is not ? A general has 4 (main) stats : Strategy, Offense, Defense, Seniority. Let's first see the first three. 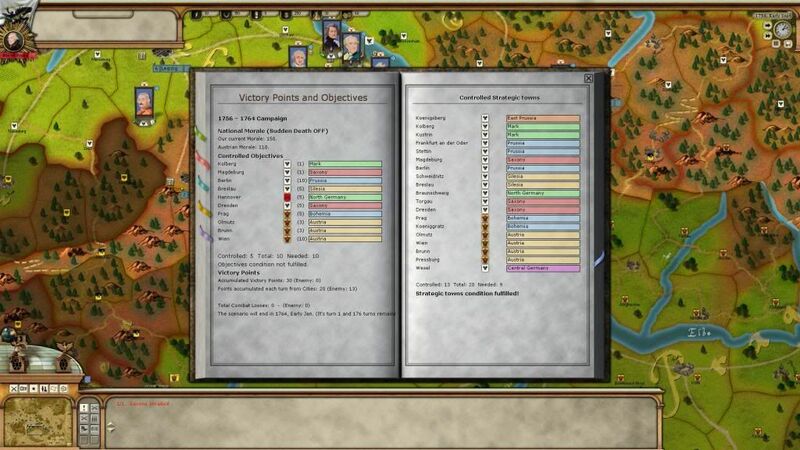 Strategy ranges from 2 to 6 - it provides various bonus when the unit is commander-in-chief (in my case, Frederick and von Schwerin), also dictates how often the unit is "activated" (a non-activated units cannot attack and moves very slowly) and gives various bonus during battles (chance to come in renforcements when a neighbouring column is attacked for instance). Offense and Defense (range from 0 to 6 at the beginning, can go beyond with experience) is just a bonus to the general when he leads, well, attacks or defenses. Only the stats of the leader of the stack is taken into account. Who leads stack, then ? Well, the general with the highest rank, and, among those, the ones with the smaller seniority. That's the problem of the Austrians : their generals with good stats have a poor seniority, their generals with good seniority have poor stats. How do I know whether an army is strong or weak ? Rule of the thumb : you can see the size of a force by the number of dots (here : Green) at the bottom left part of the leader face. Only one is small, five is huge. The color indicates how exhausted and ready to fight the unit is. It is all green for now. Now, let's get into action ! Here is the long term master plan. Not a chance it holds, but you need to have one. 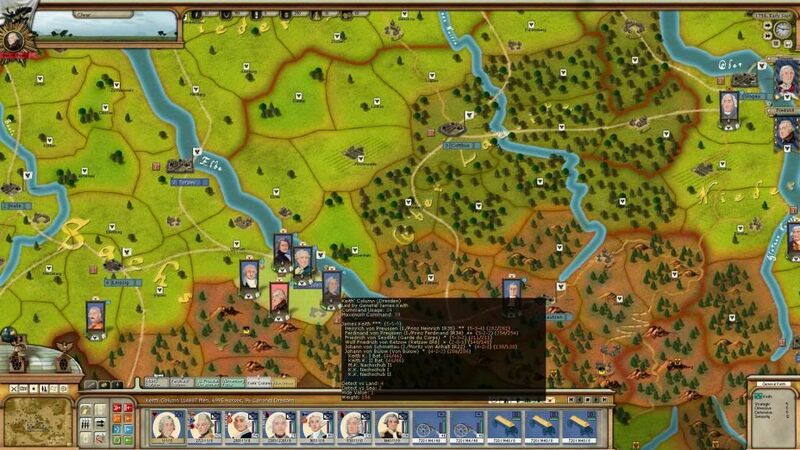 The objective is to march directly on Prag from Leipzig, just letting as few units (i.e. Moritz column, with no more supply than what the soldiers can carry) as possible sieging the Pirna camp. 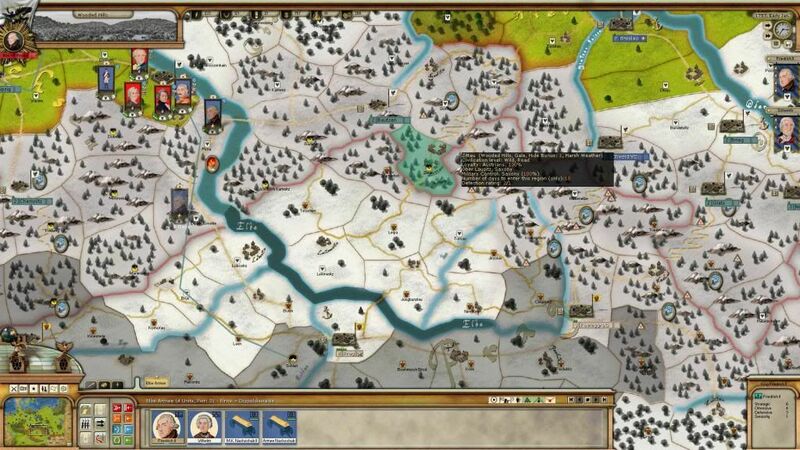 It is October, and it would be great to control Prague before the Winter (which tends to stop all military operations). At the same time, Wedell will go west and support von Schwerin, who will attack Troppau. Troppau is not an objective, but taking it will close of the main passage to Breslau (enemy armies will have to go East of the Oder river). If Troppau is taken in due time, Olmutz might be attacked, depending on where the enemy is. Frederick’s columns will winter in Prag in any case, except failure of taking it. Next year, the objective will be Koeniggratz. Maybe. This strategy let the Austrian have a passage to the center of Prussia (North of Prag, between the Elbe and the Oder), but I don’t think they would use it as it would let Prag defenseless. Moreover, I know my opponent is defensive. 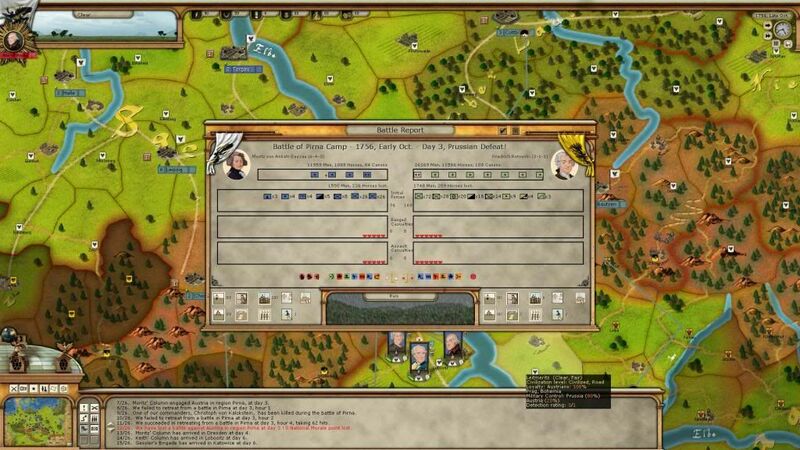 Of course, I will send 3 cavalry groups to scout the map and se where the Austrian regroup. 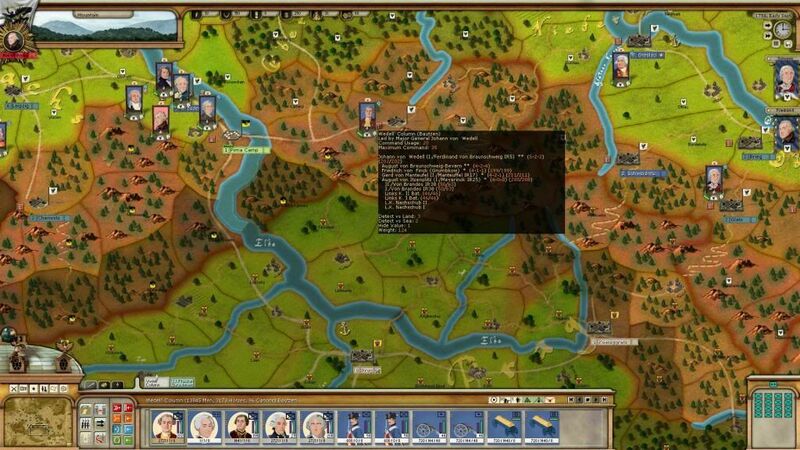 Probably in Prag, in which case my attack on Prag may be called off (crossing a river in attack is tough). 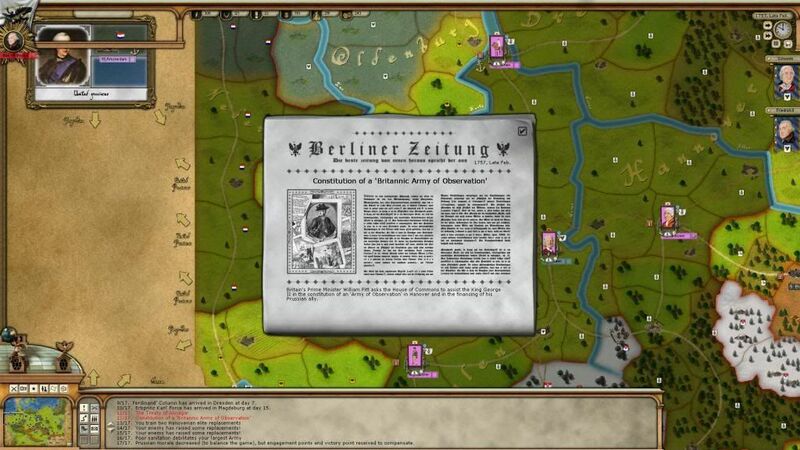 I will keep a mobile reserve of 10 000 horsemen in Kosel on the Oder, just in case von Schwerin needs back up. I did some minor moves at the back of the front. Won’t show them as they are not interesting. Yah… complex… it will be much easier later to understand later, but as the armies are grouped now and I do some reorganization, it is quite bizarre. Each line belongs to one “stack”. A turn lasts 15 days. My opponent and I give the orders… and then… 15 days pass without us being able to interfere. 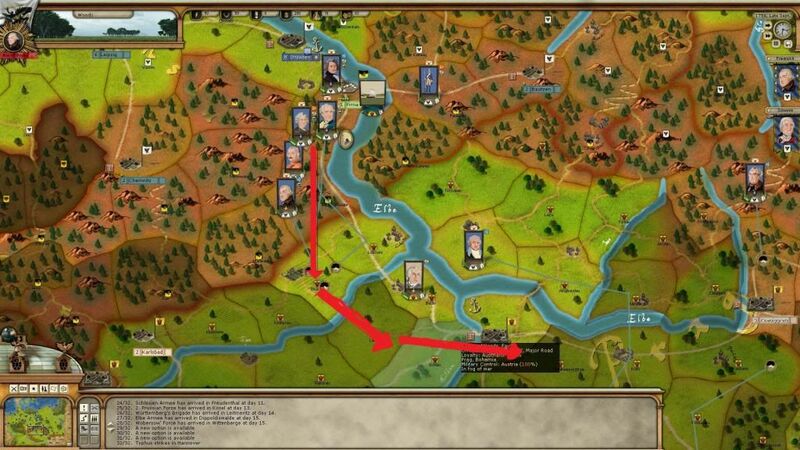 Note that I have a force (cavalry only) trying to occupy the access Pirna back from the South. 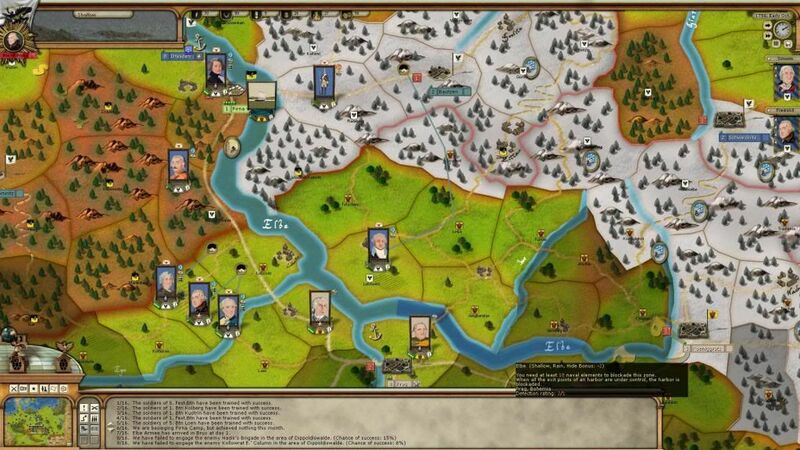 This is due to the “scripted event” of Pirna : if I can hold all the access for 1 to 3 turns, it will surrender. 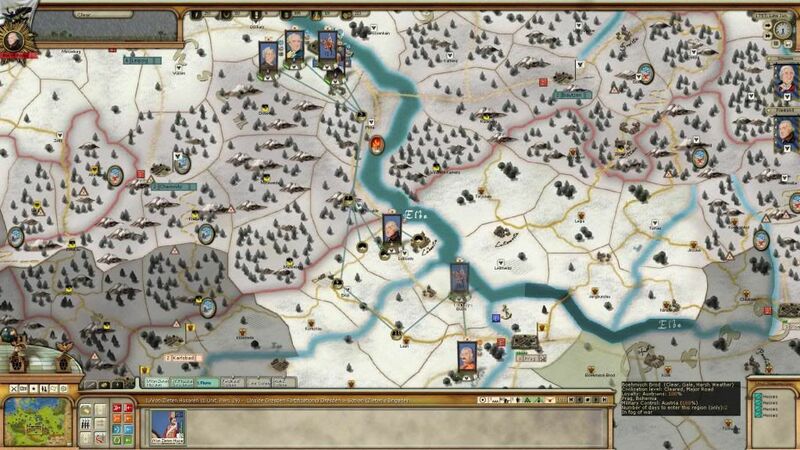 This is to be sure that even if my main troops cannot pass Pirna (has a fort often blocks the way), the other access is cut… except if my opponent send troops himself. The plan does not go exactly as expected. 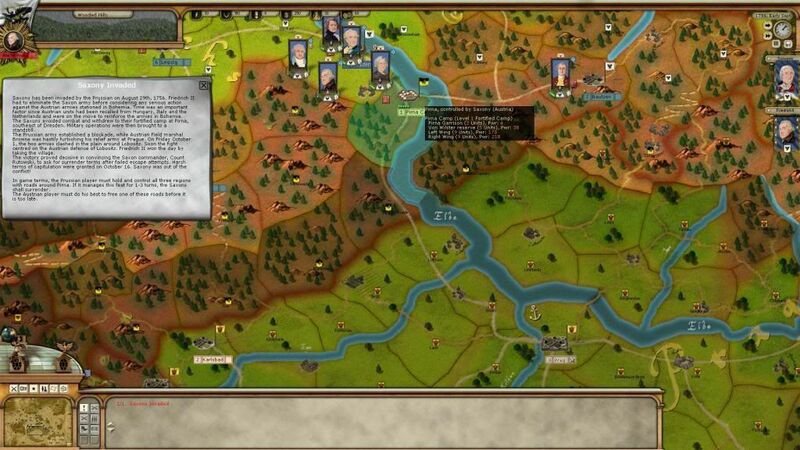 On the Western part of the Prussian-Austrian front (the Pirna-Prag axis), the march of my troops is stopped in front of Pirna (in the game, a fortress may stop the march of an enemy army). 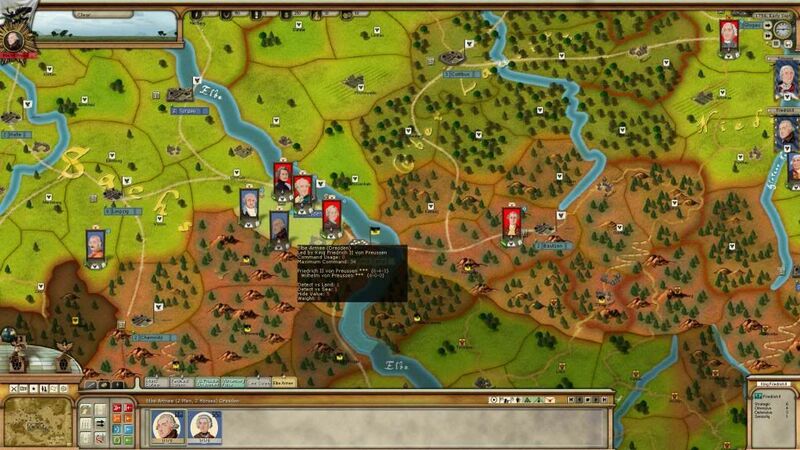 Only Frederick passes through – which is bad, because it means he won’t be able to do a coordinated march on Prag. At least, Zieten’s cavalry cuts the supply line for Pirna : the camp is now sieged. Austrian troops of General Browne and the column of General Lucchese (two poor generals) deploy in front of front of Prag. 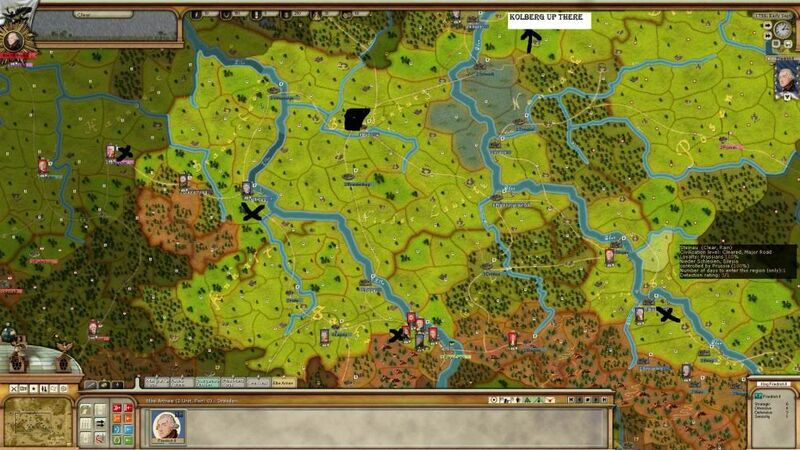 They are protected by the river, which means my troops will be at a disadvantage for a massive assault. On the Eastern Part, the plan is working as expected with Wedell being just a bit slow. The fortress of Koeniggratz is a tempting target, but I decide to carry on with the plan as I don’t want to split my forces : a crushing defeat for the Prussians, and the game is more or less over. My new plan on the Pirna-Prag axis is to concentrate forces East of the Elbe. This would allow me to march directly on Prag without battle, or to attack Browne from the South, without having to cross a river. This is very beautifully showed in the next SC. How do you know the health / cohesion of a unit ? Each unit, except a general without division (some general control groups of units “directly”) has two bars in its picture. (If a general has two bars, it means he controls a “division” of units. You can know what units are in the division by hovering the mouse over his portrait. You can create divisions (almost) freely). The purple bar is cohesion – you lose it by marching, fighting, or being in uncomfortable situation (without food in winter ? Bad). You recover it by doing nothing – you will recover quicker if you wait while in a structure. The lower the cohesion, the slower and less efficient the unit. The green bar is the “health” – how many people are able to fight compared to the maximum possible for the unit. You can only recover it in a depot / large structure, and if you have replacements available. I will cover replacements later. End of the beginner’s corner – as you can see my army now has a low cohesion (50% is low). As for Troppau, the siege has begun. 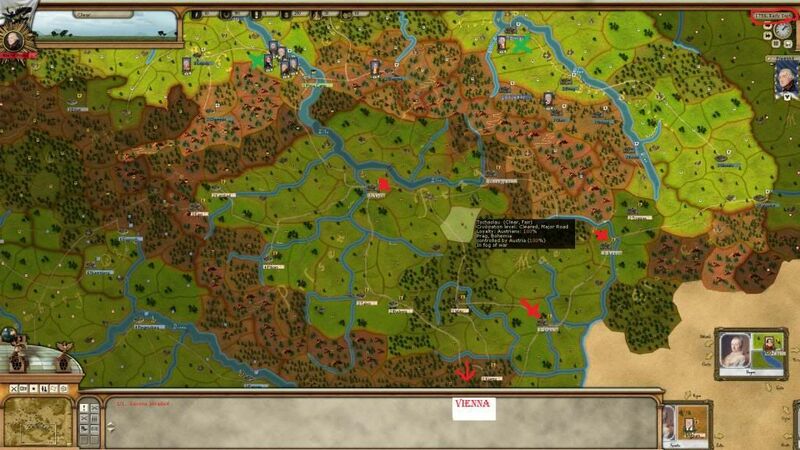 The “red” area shows the place where my army cannot go with my large army as long as Troppau is standing. But Troppau won’t stand. 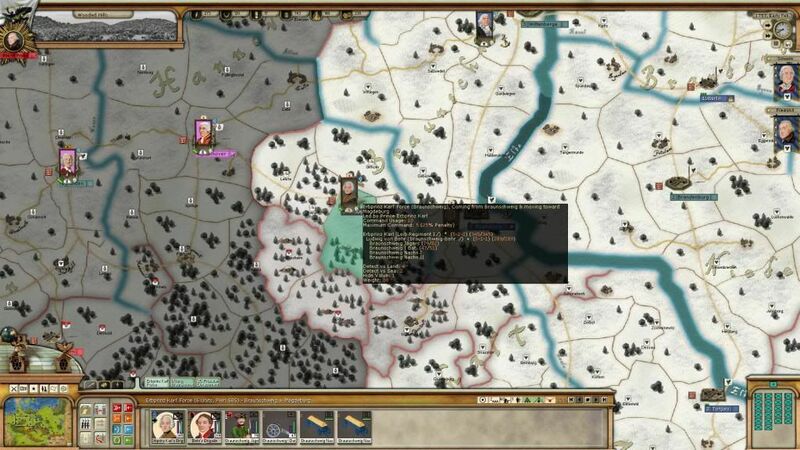 My cav scouts confirm there are no enemy army going to defend Troppau, so I am confident I can take the city – provided the wall does not last until winter. As a final note, the winter is already there in the mountains, so I have no regrets for not being more aggressive to take Prag – winter could have killed me. This was actually a fairly poor move from me to keep Moritz there alone, but well, the cost is not really huge. 1500 Prussian bodies. I still don’t like that. 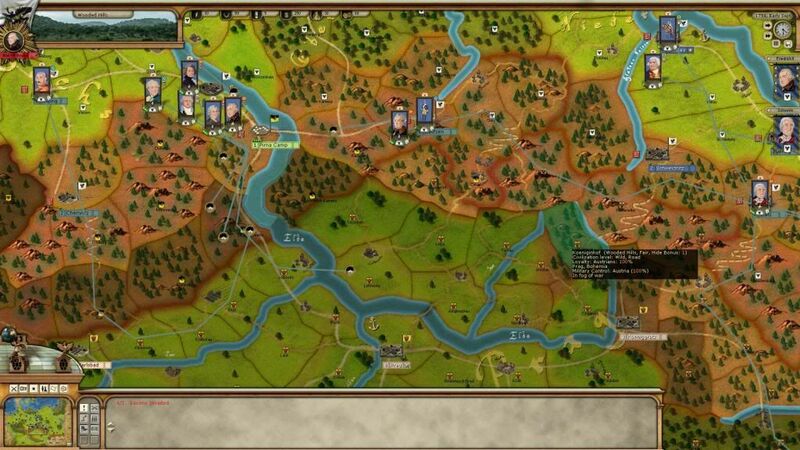 In any case, my plan is to make sure no one gets out of Pirna – I still can get a surrender as the supply lines are cut in all direction. Frederick troops goes North to block the Southern access, while my boats (shown in next picture) are going to try to hamper the enemy army to cross (I actually don’t know if Bateaux can do this – I believe they cannot). In the East, not much change. The city is still holding, and von Wedell is taking is merry time to reinforce the siege. Meanwhile, te Austrian General with funny hair, a.k.a. Piccolimi (I think), is getting closer from Troppau. Finally... no winter. I curse the climate change ! In spite of their victory against Moritz, the Saxons surrenders by lack of Austrian reinforcement (except a general – the Saxons soldiers were very disappointed). You can see the detailed effect in the toolbox in the lower part of the screen. 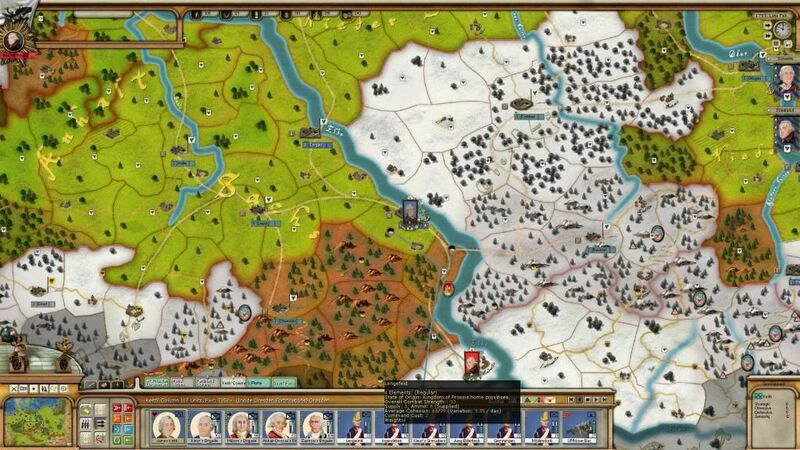 The effect is tremendous – as you can read in the description : Saxony is out of the game for now, I got their troops (so-so troops, but always nice to have) and their guns (nice guns), and Austria also has troops and guns, as a "Saxon Legion" of sort is formed. Actually, there is a shortcoming in the game on this event, the Saxons get to move, and then disappeared as the surrender event takes place at the end of the turn. It did not change anything – it would if they had attacked something. On Troppau, Wedell FINALLY arrives. Troppau still holds. As I called my cav back to resupply it, I don’t know anymore what is happening and whether Piccolimi is on his way, so I order my cavalry to be back on the scouting work. How do siege works ? When an army is on an enemy city, the city does not get any more supply but of course carries on eating whatever it has available. When the besieged units have no more supply, they surrender. But this can take a lots of time. 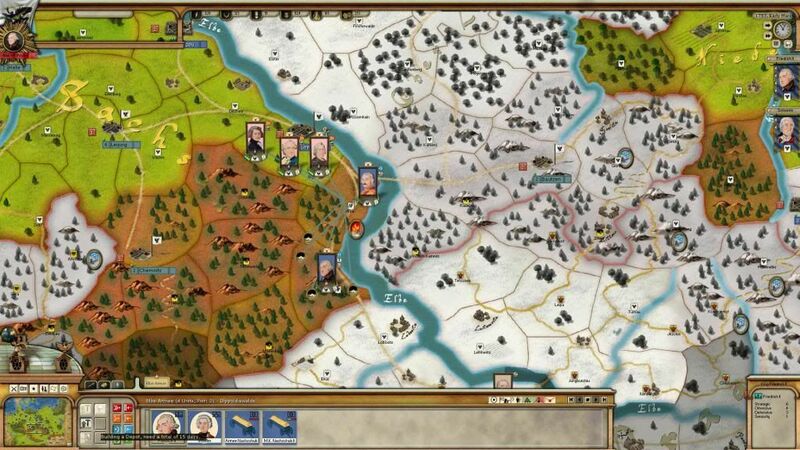 -	If the sieging army is stronger than the besieged army, there is a small chance each turn, if the supply runs low (but before there are no more supply) that the enemy army surrenders before the end. 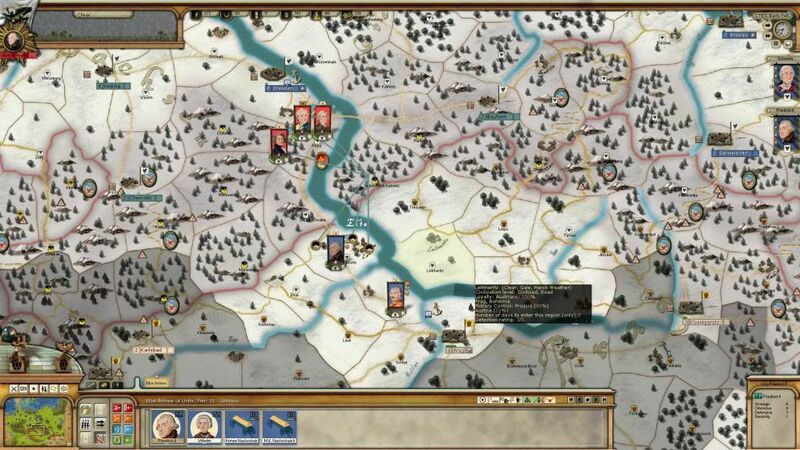 -	An army can assault the city, but ONLY if there are as many levels of “breaches” as there are level of “fortress” (2 in the case of Troppau, 3 for Prag). Each turn, the attacker runs a test, with a bonus depending on the size of his army, the presence of guns (esp. siege gun), the presence of military engineers and a few other bonus I won’t get into, versus a defender test with bonus of his own. If the attacker “wins”, the city gains one level of breach. In late November 1756, nothing interesting. Troppau stills holds – but I am confident its supplies are now running low, and General Picolomini is again on sight. As for Frederick’s columns, they are back heading back home in the snow – but they have supplies, home is not too far and the weather while cold is good so it should be no problem. Early December 1756 sees a good surprise, though ! One more breach and I can assault Troppau, as Troppau as only 2 levels of fortifications. Picolomini is still around, but I expect him to move toward me now Troppau is at risk. Note that my troops are in defense, and not “offense” as they look on the screenshoot (or on the previous screen ; more details on offense / defense next AAR). 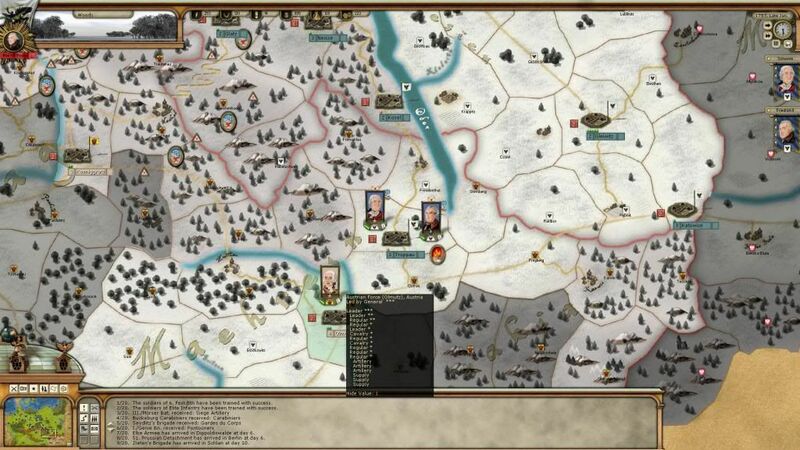 First, to get that over with, let’s just see this screenshoot, which shows that the military operations should stop now, as Winter is there. 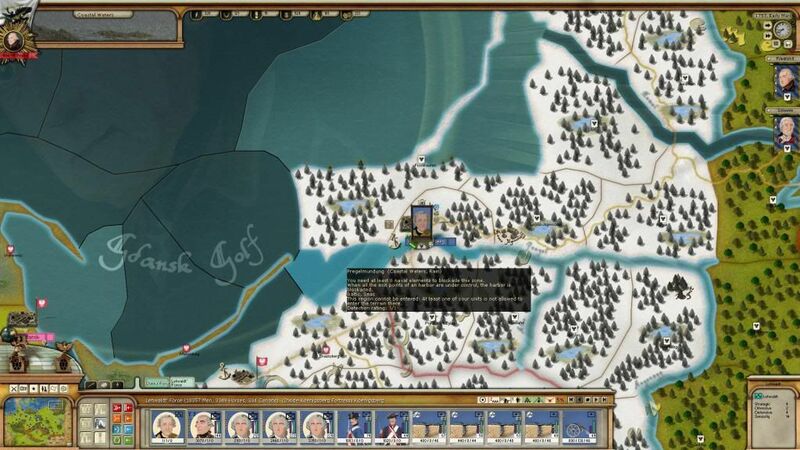 Fredericks troops are wintering in Dresden, as expected (no teleportation available back then). My troops did a second breach. I can now assault the structure and take it once and for all. But Picolomini is just there, a few days away, and will most probably try to attack me. To explain my problem, I need to do a double “Beginner’s corner”. As you have seen, I give orders to my troops for the next 15 days. But what happens if my troops meets the enemy ? Do they engage ? Do they flee ? Well, much depends on who is your commander… and what posture (a.k.a. “stance”) and Rule of Engagement (ROE) you gave them. -	Passive posture (GREEN icon) : your unit will move out of the way (in another province) if it meets an enemy army, whatever that other army’s posture is. If it is attacked, it will try to retreat ASAP. 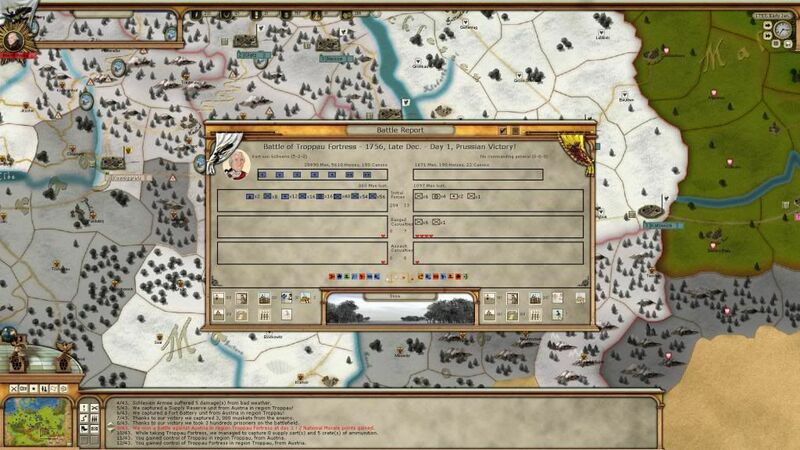 Note that there is a special order called “Evade Combat” which allows small units (a few cav, irregulars, raiders), to avoid combat and enemies without actually “moving out of the way”. -	All out attack / Hold at all cost : The army will NEVER retreats, whatever the odds are. It can still rout, though. It is to be used VERY carefully, because whole armies can be destroyed because you gave that order at the wrong moment. On attack, “All out attack” will also translate into more losses for everyone, especially you. -	Sustained attack / Defend : The “standart attack”. 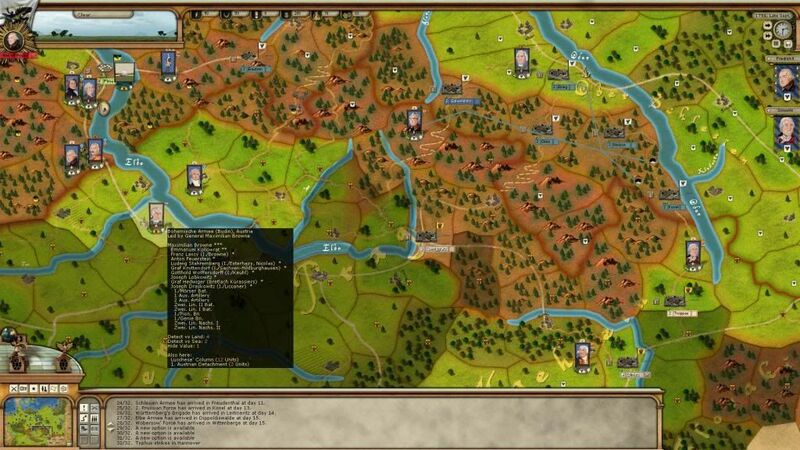 Your general will take the initiative in retreating if he feels the situation gets… difficult. -	Conservative attack / Defend and Retreat : The army will fight a little, than retreat, except if the general believes he is clearly winning the battle. Losses will be limited for both sides. Good to use when you are not quite sure of what you will meet. -	Feint attack / Retreat if engaged : Your army will retreat very quickly (Feint attack) or immediately. I almost never use feint attack, but it can be good to exhaust / slow down and enemy. Retreat if engaged is handy, though. -	An non-activated general is sulking, distraught or just play lazy : he gots a (very significative) malus in speed and attack capacity, and more importantly, cannot be set in an offensive or assault posture. Activation depends on three main factors : the strategy level of the general, the strategy level of the Commander-of-Chief of the army, if applicable, and whether the general was already active the previous turn. To see whether the general is active or not, look at the envelop ABOVE his portrait : if it is white, he is active. If it is yellow, he is not. And, back to my situation, that’s the case of Von Schwerin – he is NOT active thus cannot assault the structure. I finally decided to tell Wedell to assault and then enter the structure, while von Schwerin would stop Picolomini. Both armies (Von Schewrin’s and Picolomini) are roughtly the same size, and Schwerin is that much better than his prospective opponent. 360 dead Prussians vs 1000 for them. More importantly, I capture all the guns and the supplies there – which means it will be about as hard for the Austrian to take back Troppau as it was for me to take it. This battle is much larger, but not too much letality either. I suspect Picolomini was in “Conservative Attack” mode, and Picolomini is easily repulsed without significative loss for either side. At last, Troppau is mine ! As for Frederick, it is the beginning of a new cunning plan of mine : a Winter attack. 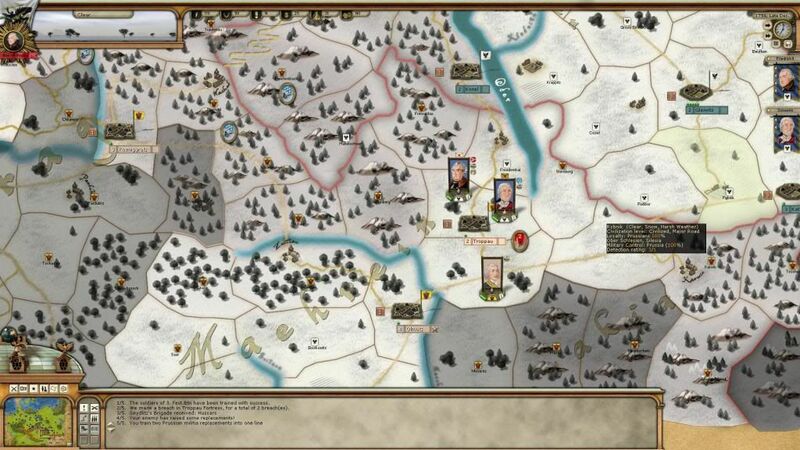 This succeded wonderfully in a previous game against Baris, during which I surprised his English main army garrisoned in a depot, sieged it and then annihilated it in the middle of winter, thus ensuring victory for Montcalm. I will try exactly the same, but before I need to set a forward depot : that’s the kind of job Frederick does not trust anyone to do, so he is going forward with the objective of setting up a depot (cost : 2 units of 4 elements of supply wagon) in Lobovitz. He takes his bro with him, to show him how it is done. Next turn, the columns will start their move, so they arrive in Lobovitz just as the depot is finished. 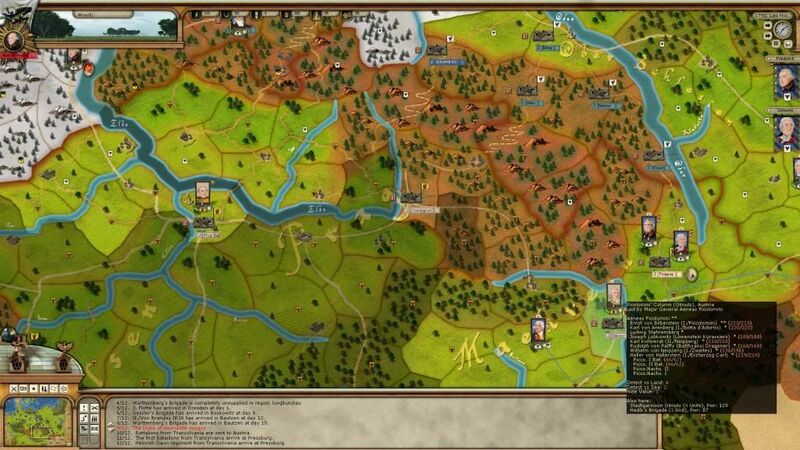 Then, it is only one turn to siege Prag and trapping the full Austrian army. Note that I had this idea BEFORE reading about the suggestion on the forum. Putting a depot in the initial rush is an even better idea, though, and I will keep that in my mind for the next game. 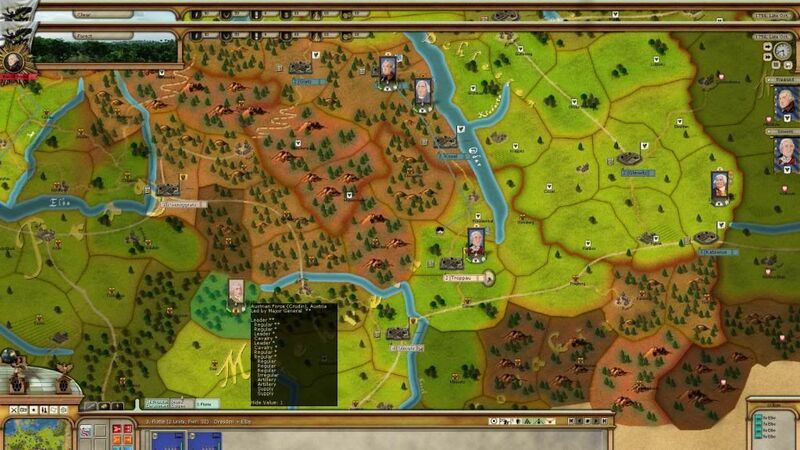 More importantly, you can see on this pic that Picolomini is not any more the leader of his army (he probably lost seniority after his battle), and that face is Von Daun – the best Austrian leader. The only good news is that if Von Daun is here, he is not in Prag. Frederick’s smart plan does not see any change ; and as you can see here, I give the orders to my troops to march toward the not-yet-built depot. The supplies they carry with them should be enough to avoid them dieing due to winter. More news on the Diplomatic front, though – with two bads news. This was to be expected, as the Holy Roman Emperor is the husband of the Empress of Austria (for complex historical reasons I won’t get into). While I don’t expect them any time soon, my defense in Eastern Prussia are wholly inadequate (20 000 troops vs expected 100 000 Russians). This cannot be good. 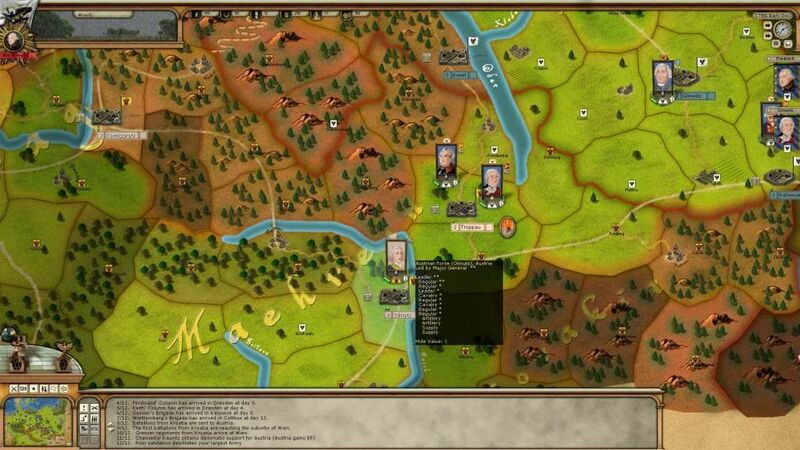 The screenshoot is not very obvious, but you can see the armies are using a weird route to go where I told them to go. This is because the mountain pass has an horrible weather, and canons / supply chariots cannot go through. 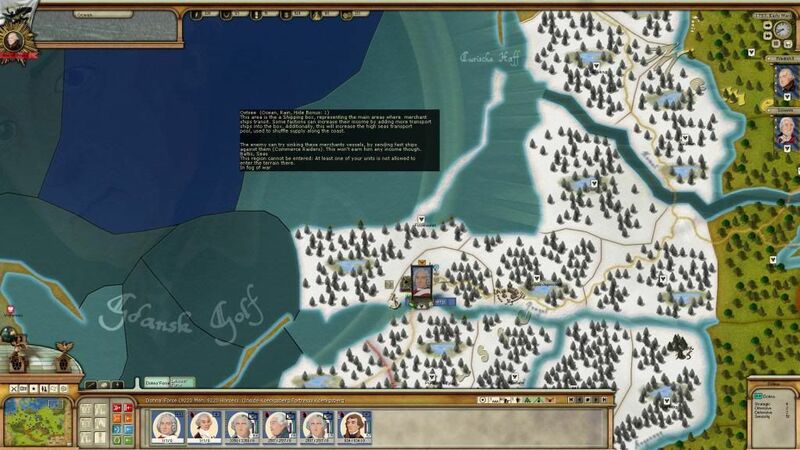 So I have to call off the attack – and my troops will be worse off than they would have been without attacks, due to frostbite (rather minor actually). The Austrian player probably never saw me making that useless and somewhat costly attempt. Frederick is ordered to remain where he is. Not much, but the leader (the Ebprinz Karl) is quite good (5-2-2 / Fast Mover / Staffer (bonus in command points). He is the son of Ferdinand of Brunswick, so it kind of runs in the family. I decide to move him in Magdeburg, where he cannot be less useful than what he is at Braunschweig. As the HRE is at war against me, I decided to go siege Lubeck with some troops from Hannover (more or less the only troops I can move. 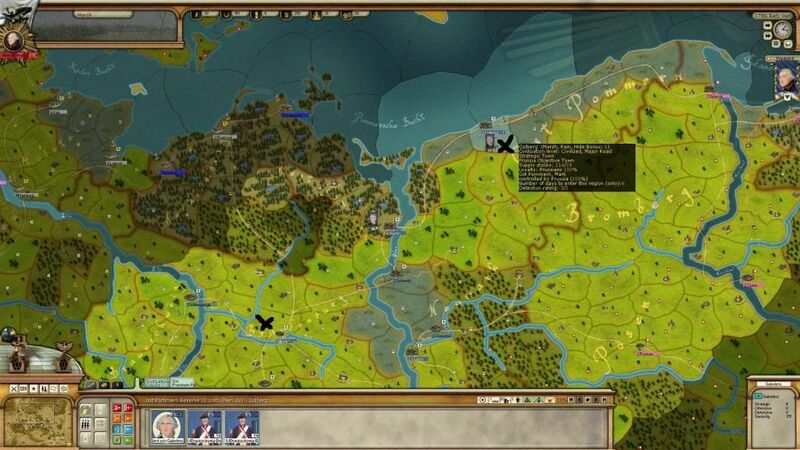 I hope to trigger a Lubeck quick surrender (scripted event – Lubeck joined Prussia after switching side historically). 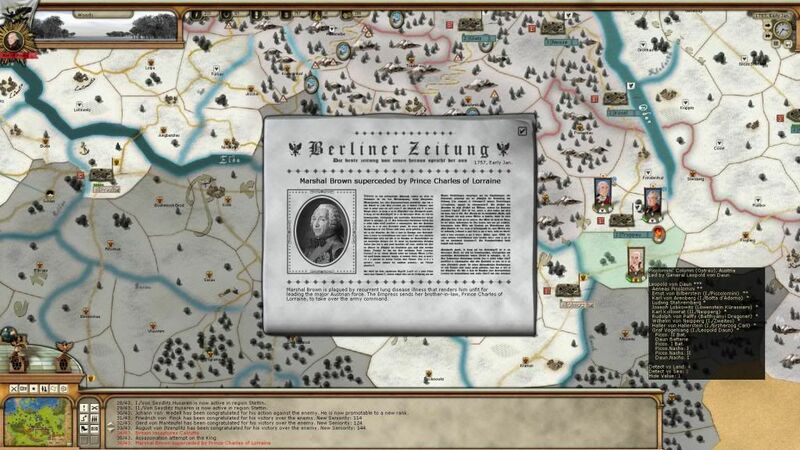 Not much happening in Late Feb, but some diplomatic victories for Prussia (100% scripted – no player influence at all) : the British create an “Army of Observation” – sort of UN of the era, you see… NOT. Poor sanitation for Keith’s column, which got some losses yet again. The “poor sanitation” event always strike the largest column of a side – this should get corrected in the next patch, but for now Keith WILL be the victim of all those events (they are rather rare though, I have been unlucky). Lehwaldt is commander the Prussian forces in Königsberg. Not really my best general, but quite good nonetheless (4-2-4). Dunno what he did to Frederick to be assigned there, though. He commands close to 19 000 men, and an awful lots of canons, most of them fixed batteries, though. He is assisted by an important cavalry force : 10 000 men and that much horses. Choosing between keeping this very significant cavalry to protect against the Russians or using it on the Austrian front is an important decision. We will see later what my choice was. Finally, It is the end of Winter in Bohemia, as you can see. 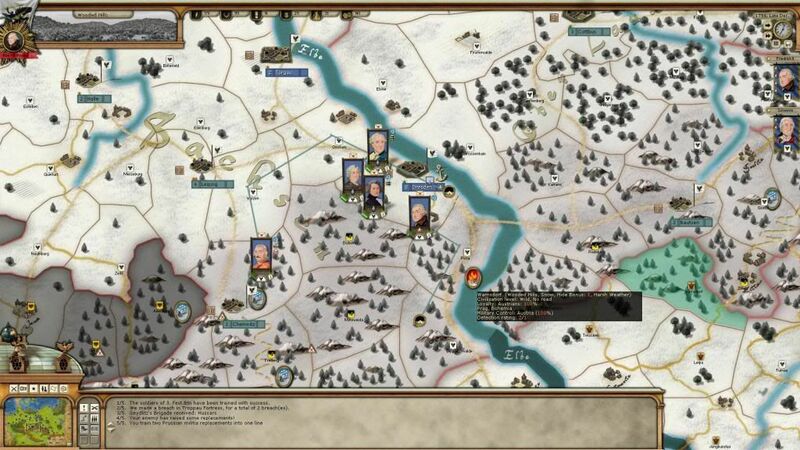 I order Frederick to built a depot at the end of the mountain, while my army is moving toward him… and toward Prag. Note that Zieten, the moustache guy, does not lead an army but just a group of Hussards - useful scouts and raiders, but definitely not the kind of people I trust for battles. 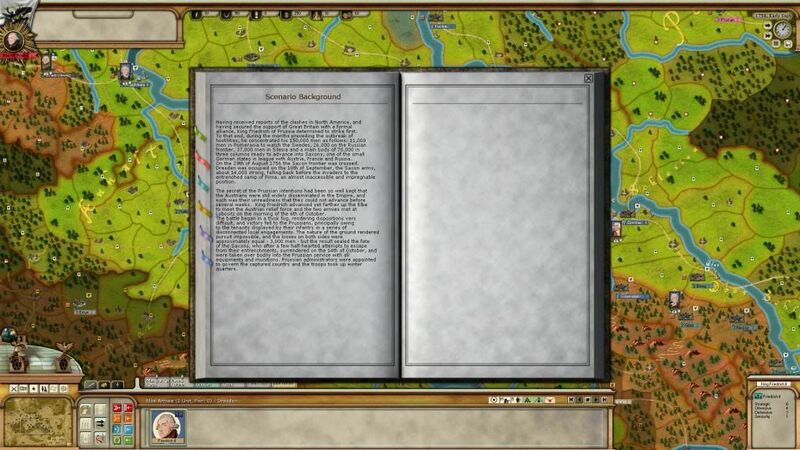 Indeed, the screenshoots are hard to see and poorly centered, the English is choppy, the text lengthy with too many details, the Beginner Corners sometimes inaccurate or plain false because I misunderstood something, but it is still my first AAR and I believe the only "systematic" one . I will miss the comments, though. It will now looks like a skeleton without flesh - still a good structure, but something missing. Narwhal wrote: I will miss the comments, though. It will now looks like a skeleton without flesh - still a good structure, but something missing. It's good to see some of these AARs showing up here. I still haven't gotten round to ROP (don't know if I will, what with the daunting PON still on my to-do list first), but this is a fascinating insight into the game and I believe that the combined AARs I read (ROP, WIA, PON, RUS) did more than anything to convince me to try these games (or at least buy them). Thanks for the efforts to preserve them, Narwhal. I have started playing ROP just 15 days ago, this AAR which i read on the Paradox forum is the BEST AAR out there for Prussia, thanks Narwahl for your- Beginner's Corners for helping Beginners like me get started. 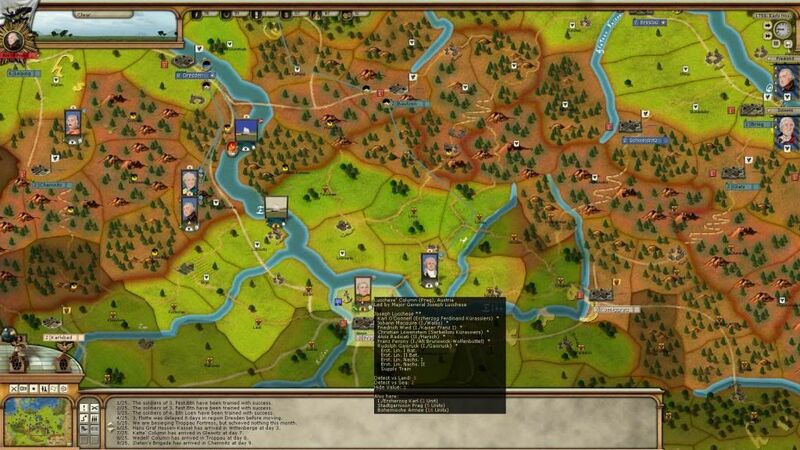 It is quite overwhelming to play Freddie's Prussians, Being Swamped from 4 or 5 sides at once is nerve wracking. Several of your tips- Hussars, Supplies and also Observations on Swedes and Russians were very useful. I gave you a mention for your beginner's corners on my Let's Plays.